Friday was our first brush with a frost. While the neighbors’ roofs had a thin covering of white, the temperature at our house only went down to 35 degrees. Because we have so many trees, our property is its own little microclimate, and temperatures are often a few degrees warmer than houses nearby. Of course, living in a milder climate means that not only do temperatures not get that cold, but temperatures do not stay low for very long. Even during most freezes, it will dip to freezing or just below for only a very few hours. 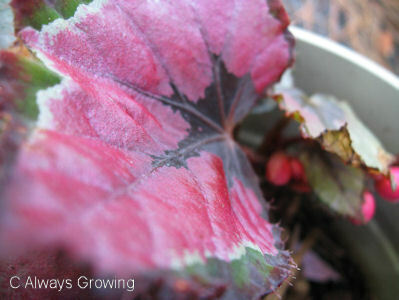 This is why so many tender perennials can survive a winter here. 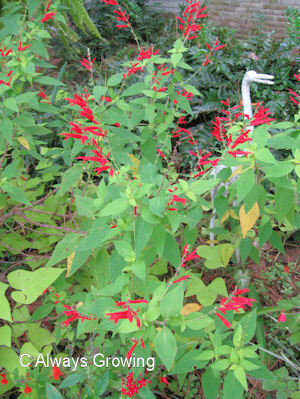 There are not many flowers out now, so having some foliage plants around makes for spots of color. 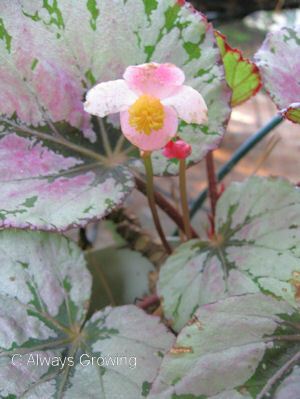 My rex begonias have spent the summer on the back patio, but I’ll soon have to move them to a sheltered location, maybe the front porch. 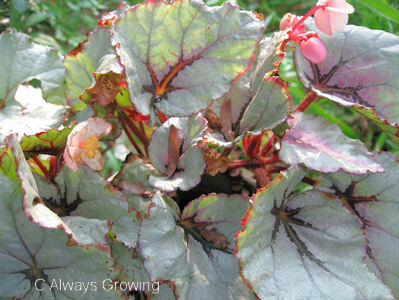 While most plants are still green (we really don’t have much fall color here) or not blooming, the rex begonias have become a colorful attraction. 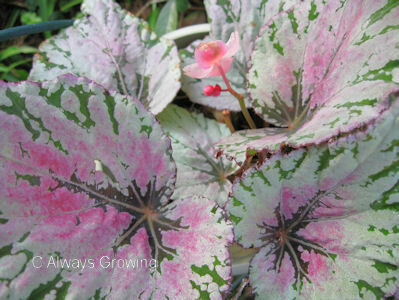 It won’t be long before everything will seem to be red and green with Christmas just around the corner, but, for now, let’s take a moment to enjoy the soft colors of these pretty begonia leaves. 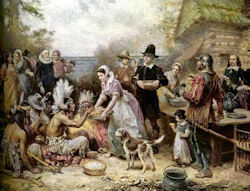 I hope that everyone has a wonderful Thanksgiving Day surrounded by love, good food, and gratitude for all our many blessings. One of the nice things about having some time off for Thanksgiving is that it allows me some time in the garden. Two weekends ago, I bought some violas and had time to plant only about a third of theme when the rains came. Today, I will be out planting the rest. I am determined that today will be a garden day. 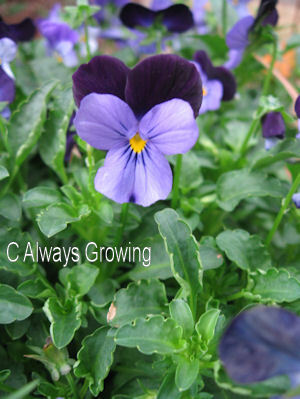 I have had better luck the last few years with violas instead of pansies, so this year it will be all violas. One thing that surprised me was how limited the selection of cool season bedding plants there was this year. I guess with the economy, retailers have cut back on their stock. Because of this, I am beginning to wonder if I ought to consider growing more plants from seeds for this spring to get the colors, etc. that I need. But, like Scarlett O’Hara, I’ll think about that another day. Right now, I am going to be thankful that today, I can enjoy being outside planting my favorite flowers. Today was a very sad day for us. We had to say goodbye to one of our sweet little cats. Little White Cat was almost 15 years old and had been sick for a while. We adopted her from the local animal shelter, and she was so sweet and gentle. While she was always an inside cat, she did like it when I would hold her in my arms and walk her around the garden. We will certainly miss her. Whenever I look at the white cat’s whiskers growing in the garden, I will think of her. Goodbye, little white cat. Last Sunday morning, I was so surprised when I opened the front door to go out to pick up the newspaper. Fog had rolled in overnight. 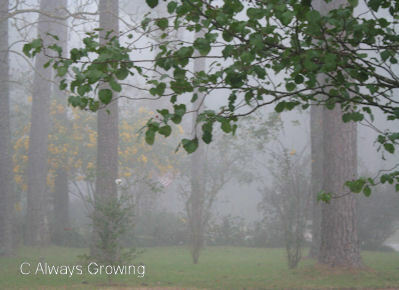 It is so unusual to get fog at this time of the year. The garden looked so peaceful and serene in such an atmosphere. I was immediately reminded of the poem “White Fog”. In dripping wreaths of amethyst. No bird has heart to speak aloud. Myself remains to comfort me. Black Magic. What an evocative name for a plant. 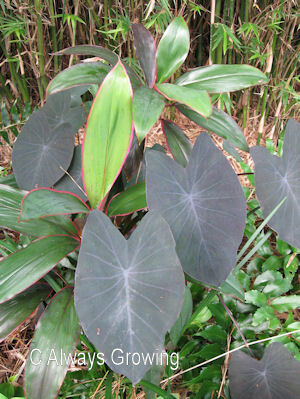 I have had Black Magic elephant ears in my garden for several years now, but this year they were a little puzzling. The leaves didn’t turn dark until just recently. Normally the leaves are a dusty purple-black which makes such a nice contrast to the other foliage plants I have around them. I don’t know if it is because of the unusually high summer temperatures we had or what, but the leaves were a dark green all summer. This happened to all of my Black Magic plants which are planted in several different areas of the garden. It is only in the last two to three weeks that this plant is starting to look like its old self. While these are hardy in our area, the leaves will die back with the first freeze. Fortunately, that first freeze date is a ways off, so I should be able to enjoy the dark leaves a bit longer. Thanks to Carol of May Dreams Gardens for coming up with GBBD. This is the day (15th of the month) in which we post everything which is blooming in our gardens. I am a day late with this posting because of computer problems last night. While most of the gardeners in the northern hemisphere are showing wonderful fall color, it is still mostly green here in the Gulf Coast. If we do get any autumnal color it is usually not until late November or December. 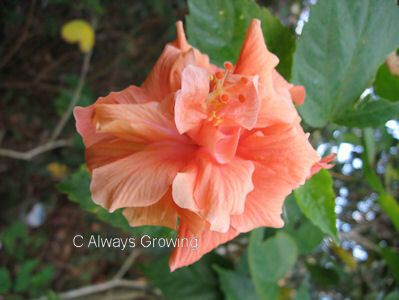 Many tropicals such as the hibiscus and butterfly gingers are still blooming. 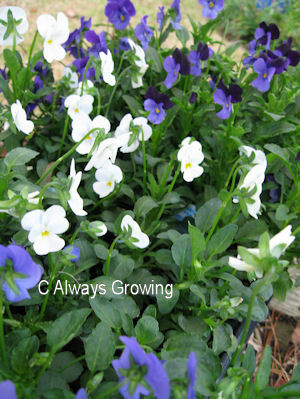 I have just started planting the fall annuals, and, of course, the violas are blooming. The sages are still blooming: pinapple sage (both regular and Golden Delicious), coral nymph, lady in red, autumn, and Victoria blue. 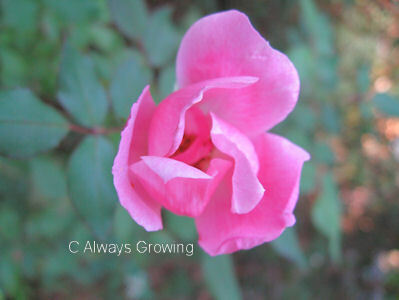 The roses are starting to look even better now that we have had some cooler, drier weather. The knockouts (red, pink, and blushing) are blooming nicely as is Iceberg, The Fairy, and Mutabilis. The trees and shrubs blooming right now are the cassia tree with its gorgeous golden flowers and the pink and the withe hibiscus mutabilis (Confederate rose). 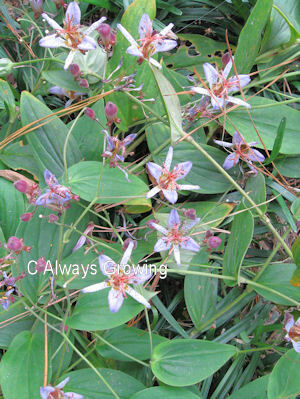 The toad lilies are still putting out flowers. Even though I cut back the cat’s whiskers just a few weeks ago, they have grown back and are blooming again. 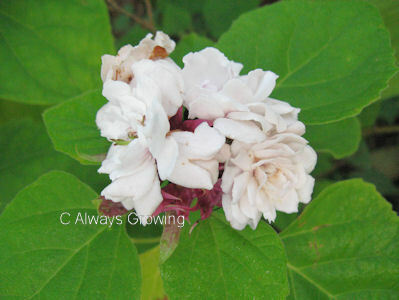 Clerodendrum phillipinum has recovered from the high heat and drought of summer and is blooming again. A few other things are blooming: butterfly weed, gerber daisy, torenia, a few azalea blooms have shown up, blue daze, and Mexican sage. Not too bad for the middle of November. Sun back lighting flowers and plants is always so striking. Now with the sun at a lower angle, the opportunity for capturing a backlighted subject is greater. I have to leave for work very early in the morning, and now that daylight savings time is over, it is still dark, so that leaves the weekends as the only time to get up early and stroll around the garden with the camera. This morning, the sun was just starting to break and this allowed some great “sun” photos. Since I am just starting to try to take photos of backlighted subjects, I was pleased with my first attempts. This unknown sasanqua was my best attempt at this technique. The sun really cooperated with the lighting here. The next photo is not as dramatic, but the Mexican bush sage really stands out in the garden with the sun seeming to light it from within. The sun seems to rise so quickly that the correct angle for back lighting is soon gone, but that doesn’t mean that the sun isn’t still giving me a chance to take a good photo. 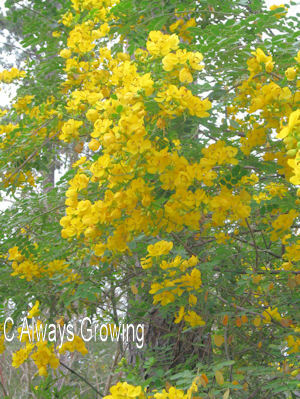 The cassia tree is in full bloom now and with the early morning sun flooding the area with light, a good close up of the flowers is possible. The sun’s light sure seemed to set off the garden today. When it comes to my garden, it doesn’t take much to make me happy. 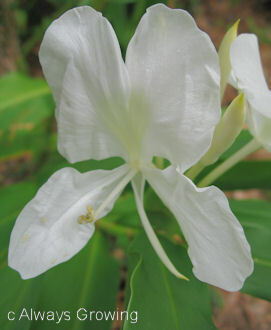 A new flower, especially one on a plant that has never bloomed before, really is something I look forward to seeing. While prowling around with my camera this past weekend, I suddenly spied a new flower. This is the first time I am seeing this flower. It is on a ti plant that my mother gave me about two years ago, and this is the first flower it has ever produced. The stems as well as the tiny flowers are such a pretty shade of pink. I was rather amazed to see this flowering at this time of year. While, we have not had any real cold weather, we have had several chilly days and nights, and I would have expected this plant to flower in the warm summer, not in mid-November. This certainly was a nice surprise. There always is a bit of excitement when a new flower shows up, and it doesn’t even have to be a new purchase plant either. 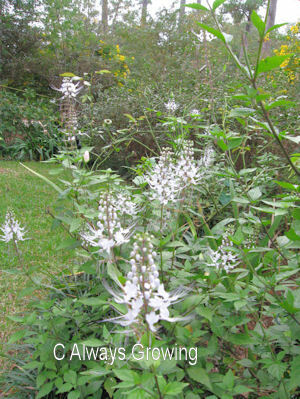 Those that bloom only once and don’t appear again for a year also cause a bit of a stir when they start flowering. Now is the time of year when the sasanqua camellias start blooming, and I have already shared my favorite, Yuletide, in a post just a few days ago. Well, when I pulled into the driveway late this afternoon, I noticed a single white flower on another sasanqua which means that it too is starting its annual show. Unfortunately, I do not know the name of this particular sasanqua. I bought it when it was not in bloom, and even though it had a tag and the container was labeled “Yuletide”, it turned out to be something else. At first, I was very disappointed, but after only a few of these white flowers with pink edges showed up, I quickly made up my mind that I liked these one too. 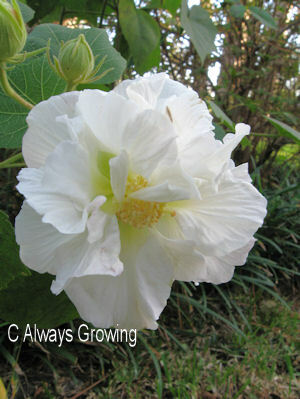 I just wish I knew its name, because now I’d like a couple more since it is a fast grower and a prolific bloomer. 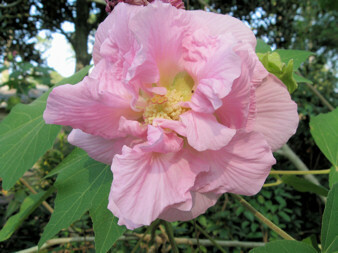 This particular sasanqua camellia certainly did turn out to be an unknown beauty.